Psytronik Software is proud to present MANCAVE, a game from the team that produced the fun scuba-romp EXPLODING FISH. MANCAVE follows the hilarious adventures of Richard Morningwood (heh!) who has the unfortunate task of gathering up the pages of some rather naughty magazines that have been nabbed from his secret stash by his pesky kids! 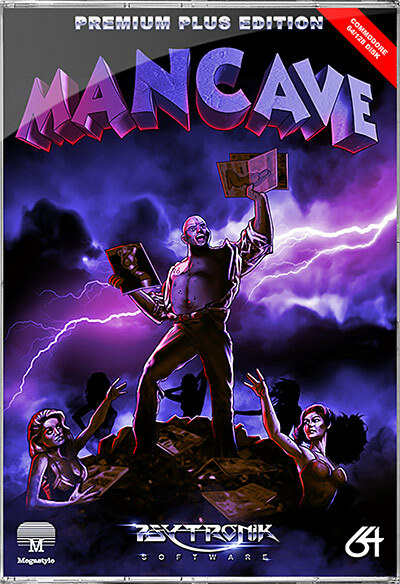 MANCAVE will be AVAILABLE SOON from Psytronik Software and will be available to order in standard cassette format, a special clamshell tape edition (limited to 50 copies), budget C64 disk and premium+ C64 disk. The game revolves around our hero, Richard Morningwood. Father to two brat kids, Brad and Kyle. Husband to the long-suffering Betty. Son-in-law to the totally terrifying Fannie. Arriving home from work one evening, Richard sees that his precious man cave has been turned inside out by his mischievous kids. They have discovered his secret stash of adult magazines from his days as a teenager and spread them all around the house for his wife to find! This has done nothing good for his already extreme stress levels and his poor heart is now working overtime. The player must guide Richard around his house and collect up all his magazines before his rising stress levels have fatal consequences!